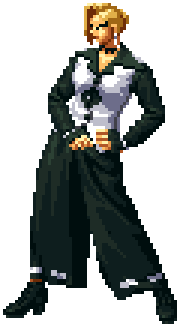 Mature (マチュア) is one of the two secretaries of Rugal Bernstein and also a trained and ruthless assassin. The first appearance of Mature allready took place during The King of Fighters '94. She was one of the two Orochi assassins (the second being Vice) that work for Goenitz, one of the Four Heavenly Kings of Orochi. When Rugal Bernstein tried to take control of the Orochi power, Goenitz went to face Rugal and gouged out his right eye as punishment. Surprised that he was still alive, Goenitz allowed him to possess a small part of the Orochi power, but warnd him not to use it until necessary since it would eventually kill him. Goenitz then assigned Mature and Vice to keep an eye on Rugal to make sure he doesn't do anything to jeopardize the Orochi clan. Mature and Vice became Rugal's secretaries and aided him in the organization of the first two King of Fighters tournaments in 1994 and 1995. Mature was assigned to take care of the details of the first tournament in 1994. She did not see any display of Orochi power from Rugal during that year, but he unleashed it in the tournament the following year. As scheduled, Rugal died from the overwhelming power. With their mission accomplished, Mature and Vice returned to Goenitz. Once reunited with their master, Goenitz assigned them a new "client". He was Iori Yagami, bearer of Orochi blood and a candidate for joining their cause. The two assassins decided that it was in their best interest to side with Iori against Goenitz. So the entered The King of Fighters '96 tournament together as a team. When the finals came up, Mature and Vice knew that Goenitz was going to strike, so they warned Iori who went after Goenitz. As planned, Iori fought against Goenitz since he considered Kyo to be his to kill. Goenitz quickly realized that he had been betrayed by Mature and Vice. Upon his defeat, Goenitz cursed both assassins and told them that they would die at the hands of their "savior". Not understanding what their former employer meant, Mature and Vice went to assist Iori, but Iori began to enter the Riot of Blood. Realizing too late that Iori was unable to control his Orochi power, Mature and Vice suffered the cutting edge of Iori's hands and were left to die. This page was last edited on 18 January 2009, at 11:42.